I’ve been working in a day centre for about 6 months now, and found the experience engaging – I wrote a case study highlighting the situations I found there. One instance was the use of the single iPad in the centre, and how it was limited by not being connected to the TV set which would open up the potential involvement and engagement of other centre users. I first thought a direct cable would be sufficient, but there are much more interesting options such as the Apple TV unit, a Chromecast or a Roku streamer, all would be able to stream content from the iPad to the TV, with more options than a cable would offer. This is a great way of using the media created and stored on the iPad, but it leaves the content on the machine, which is not useful for staff to make use of the images stored (over 1000!). Note I haven’t mentioned the use of the corporate IT systems, which are for office use; I cannot imagine, or realistically envision an installation of iTunes on one machine for the purpose of accessing the device being attended to. I had an idea some time ago about creating a localised platform for enabling people in a daycare/sheltered housing situation to share media content with one another. I use the term localised, as the likes of Facebook and other social media platforms are quite happy to take your images and use them, but then claim ownership. Then there is the issue of ‘Where In The World is Your Data?’ a game not suitable for social care environments. In many instances the use of social media can be a bridge to relatives scattered geographically, but for people with the onset of dementia, there is a clear need to be able to remember what was done last week. Syncing an iPad with a Raspberry Pi to store videos and pictures should be straightforward. Should be. I started mapping out what this ‘Memory Hub’ was meant to do, talking to good friends/colleagues James Stevens and Peter Allen in the process. I thought that the platform should enable people to publicly share (and date stamp) and view from a variety of devices and operating systems to a public repository…this is quite a tall order. The order was made somewhat taller by my choice of hub device/server being the humble, yet proud Raspberry Pi. The requirements and budding complexity prompted a rethink. The ‘Memory hub’ is an idea that surely deserves more exploration, but the initial premise of enabling access to the data on the iPad without the clunky recourse to email needed to be looked at further. 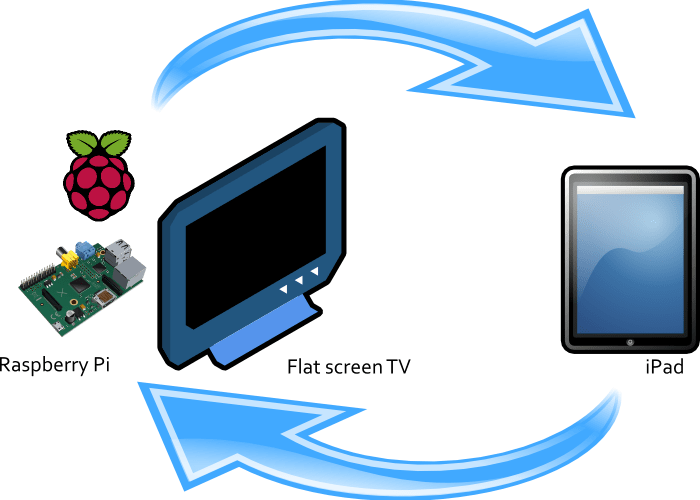 I then looked at using BT Sync as a means of moving data around the network without any intervention, and using a media player to access the files moved on to the Pi sounded like a straightforward idea – but the 2nd generation Pi we installed the software on didn’t want to sync at all…and as such no media player was installed. Yet another rethink. BT Sync has a very good support for a whole range of devices and was practically ideal. SyncThing was also looked at as an Open Source option, but the device support is not as broad, or rather in this instance IOS was not supported. After another talk with James, we decided to install the media player first, as there may be a plug in that would let us sync up other devices. He then recommended Kodi, an optional stand alone media player, with an architecture optimised for the Pi. It worked great in tests, even showing how little CPU time was being used. So, we have something to play with now – but it doesn’t see the iPad, unless it was jailbroken. Ah well. The next day we sat down again and installed Owncloud, another option we had previously discussed as the basis of the Memory Hub idea. Owncloud provides ‘cloud’ storage across a network which can be accessed by many different devices, and after installation set up my Android phone with a client and after a bit of fiddling around successfully uploaded a couple of images. A success of sorts! So as of the 22nd October, that’s where we are. The next steps are to point Kodi at the respective uploads and start creating libraries.